With grateful thanks to Roy Cameron who is a resident of Coolah in Australia who has very kindly sent over all this information about the Demarco family who emigrated from Italy to Coolah in 1898. 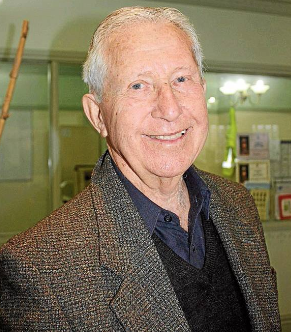 Roy has been recognised by the Government for his work as a local historian and has written many books about not only Coolah but also other neighbouring towns nearby. He was awarded an O.A.M. which is an Australian medal awarded by the Sovereign for outstanding contributions to his works. Dr. Emilio De Marco qualified at the University of Bologna in 1898 and was registered in New South Wales on 2nd November 1898. He went to Coolah as the result of an appeal by a local committee who guaranteed him a minimum yearly bonus of Eighty Pounds. Dr. De Marco and his 21 year old wife Rachael took up residence at Loima which is about a mile from Coolah. Coolah in New South Wales in Australia was first settled by pastorialists circa 1840. Prior to European settlement the district around the Coolah valley was occupied by the Kamilaroi and Wiradjuri peoples. * In 1823 explorer Allan Cunningham became the first European to reach the district when he crossed the Warrumbungle Range at Pandora’s Pass and moved down on to the Liverpool Plains. * In 1826 Governor Darling declared a boundary to the settlement in New South Wales declaring “land beyond this point was neither sold nor let, nor settlers allowed.” This was 9 km north of Coolah. Around this time the Black Stump Wine Saloon was established and named after the Black Stump Run and Black Stump Creek. * The district was surveyed in 1832 and squatters moved in searching for fresh pastures. * People began to settle in the Coolah district in the 1840s. Coonabarabran Coroner held an inquest at Loloma, Coolah, on 2nd instant on the body of Rachel Ines De Marco, wife of Dr. De Marco of Coolah. First class constable Thomas Holden Richard Preston stationed at Coolah deposed that at midnight on Christmas Day he received information that Mrs. De Marco had died suddenly at Loloma. He proceeded at once to Dr. De Marco’s residence in Loloma and he saw a body which he recognised as that of Mrs. De Marco, lying on a bed nearest to the door. There were two beds in the room. He was informed that Mrs. De Marco had died about 9.00pm on another bed in the same room. Her clothes had afterwards been changed and the body removed to the bed she was then on. There appeared to be no marks of violence on the body. He saw a number of sheets and other clothes marked with blood, which appeared to have been vomit. He took possession of these and made a thorough search of the room. In a chest of drawers he found a small box containing an enema and a small packet which he believed to be corrosive sublimate. The packet had been pinned up and the pin was loose in the box. It was thickly corroded as though it had been in the packet for some long time. He was informed that this drawer was found open when it was known that Mrs. De Marco was ill, but it was closed when he arrived, and the things in the room had apparently been rearranged. He noticed two tumblers on top of the drawer which apparently contained water. On the top of one of them was a box of wafers said to be used for taking water with. He saw Dr. De Marco pick up a sheet of paper on which there were 2 or 3 rough drafts in pencil of and a note to Ada Putney. A portion was torn off that he could not find. Three of the drafts were versions of the same note, asking Miss Putney to come ‘up’, as she wanted her to do – the door would be open and to come right in. It was dated 25th December. He got a note from Miss Putney written on ink of which the others were copies with slight alterations. Mrs. De Marco did not speak English well, and apparently made copies before she wrote a letter. Another draft unfinished on the same sheet was also dated 25th December, apparently written later, requesting Miss Putney not to come. The lady said she had received that note. There were a number of letters in Italian but not written by Mrs. De Marco. On a counter in the surgery he found a bottle holding corrosive sublimate or bi chloride of mercury, which appeared to be the same as that in the packet. The police remained in charge of the body from the time they saw it until the inquest. He knew of no reason why Mrs. De Marco should commit suicide, and there was nothing to show that she might have taken poison accidently. He did not hear that she was ill until he received information about her death from Mr. Putney, who said Dr. De Marco had sent him. William McConnaughty, a boy 16 in January, was a servant with Dr. De Marco. On 25th December the Doctor came out of his room at about 8.00 am and had his breakfast. He said he would have dinner at Mrs. Walker’s and to come down for ……rs. De Marco had dinner at about 12 o’clock. After he went away Mrs. De Marco called him at 10.00am and asked him to bring her dinner at 1 o’clock. At her request he took a letter to Miss Putney. Mrs. De Marco was lying on the bed dressed, but had no boots on. She said that if Mrs. Walker asked how she was to say that she was a little better. At one o’clock he returned and Mrs. De Marco was lying in the same place with her head hanging over the pillow. Asked if she would have dinner. She said she was dying. He asked her if he should go for the Doctor. She said, “yes at once”. he immediately got on his horse and galloped off. There was no one with Mrs. De Marco when the witness left and no one came with the Doctor. He did not ask anyone to come. Witness came about half an hour after when the Doctor was in the Chemist Shop mixing medicines. Asked how Mrs. De Marco was and he said “Bad”. He often saw the bottle produced in the chemist shop. He had to attend bringing water and other services when the Doctor was busy in the Chemist Shop. He brought water and other things when the Doctor was with Mrs. De Marco. He could hear her say something in a faint voice and broken voice, but could not hear what it was. It was very likely Italian. When the witness went away there were more than a dozen eggs in the pantry. When he returned the second time there was the white of an egg splashed on the pantry door, and eggs broken all about the pantry. TheDlctor threw some eggs out which she had vomited into a vessel. At about 1.30 the Doctor came out and said she would die. About 2 o’clock he was told to go and take the sulky and bring Mrs. Martin. I brought her and Mrs.De Marco was still alive. Dr. De Marco was crying very much and could see through the door where Mrs. De Marco was vomiting. At about 8.30 Mrs. Martin sent witness for Mrs. Walker and Mrs. Walker came at about 9.00 o’clock and Mrs. De Marco was dead. She was not well and did not eat anything on Christmas Eve, but was walking about and there were several people at the place. The witness had never heard any quarrelling or disputing between Dr. and Mrs. De Marco. They used to play and run about just like children, and after meals they would sit and talk for hours. Witness was in and about the place every day. He did not know any reason as to why she should commit suicide, only she was very lonely. The Doctor had to go down-town every night (almost a mile) and then witness had to go down for things and Mrs. De Marco would be entirely with herself. Mrs. Walker was with Dr. De Marco when Witness told him that Mrs. De Marco was dying. Dr. De Marco did not tell witness to inform the police when he said Mrs. De Marco would die. He did not say what was the matter. Emilio De Marco, a legally qualified MD registered in New South Wales gave evidence that at 4 am on the 25th his wife, who was sleeping in the surgery called him in. He made an injection of morphia, to relieve some pain she was suffering, peculiar to women. She had been taking morphia for eight months and had always got him to inject it. He had no tabloid to make the injection himself. His wife had a slight knowledge of medicine and a few days before she took some calamel. They usually slept in the same room, but since the heatwave she generally slept in the surgery and he in the bedroom. He produced the huypodermid syringe he had used. On ordinary occasions he injected one-sixth of a grain, or to be strictly correct one centigramme – this was the injection at 4 am on the 25th. He then left the surgery and went to his own bed again. He woke at about 7.30 and she was lying on the other bed in her room. He asked her how she felt and she said she was better but drowsy. He went out for about an hour and when he returned she was sitting up and seemed better. Later they were talking about going down for dinner, and she said she did not feel well enough to go. He then said he would send the boy down for some dinner and they would have it together. She said “no” he had better go down, as they had often been asked and the people would think they did not want to go. He went about 10am. And she seemed very well. At about 11am the boy was down and said she was better. The boy took the dinner up at about 1 o’clock. At about 2 o’clock the boy came and asked him to come up as his wife said she was dying. Immediately he saw her he concluded from the vomit and the egg shells lying about shat she had taken corrosive sublimate. She was in terrible pain and her breathing was very hard. She knew a good deal about poisons and knew that eggs were an antidote for corrosive sublimate. He caught her by the arm and said “My God, what have you taken?” and she replied “Nothing”. She knew the antidote to many poisons. He asked her several times about the poison and she would not answer, or would speak of something else. He gave her Iodide of Potash, but she threw it up, and he then injected into the bowels, when she said “It is no use it is too late”. About 4pm he injected two doses of Morphia of a centigramme each, to relieve the terrible pain, when she said she felt better for about an hour. She would not allow him to inject ether, and he injected caffeine. He did everything he could for her. The last time she spoke he asked her if the light was too strong for her eyes and she said she could not see any longer. She tried to speak about a quarter of an hour before she died, but she could not. She often spoke as if she did not value her life very much, but never talked of suicide, although she had questioned him about poisons that caused the least pain in dying. Just before she died she sat up and put her arms around his neck and tried to speak, but could not. She died that way. He did not think the bottle produced was on the counter when he went away. One may live for 30 hours after taking corrosive sublimate. His wife died in an unusually short time, and must have taken a very strong dose. The easiest way to take that poison would be with water. They were on very friendly terms but she seemed depressed and lonely and fretted because she had no children. She cried sometimes and wanted to go back to Italy. She must have known what she had taken by her taking the antidote, thought she took the antidote because the pain was so severe and she could not endure it. Thought if she wished to save her life she would have told him she took the poison; she had no other poison for which eggs were an antidote. There were shells all about the room. He thought she took the painful poison because it was slow and she would be able to see him before she died. If she took morphia she would go to sleep and never wake again. She knew of a man who had poisoned himself with corrosive sublimate. He was too excited and distressed to think of reporting the poisoning to the police until after she had died. She was 21 years of age, and was born in Bolognia, Italy. Anne Martin, a nurse, disposed that she was sent for at 6.30pm on Christmas Day and arrived at Loloma at about 7.00. Dr. De Marco was with Mrs. De Marco in her bedroom. She was jasping and could hardly speak. They were speaking in Italian. He was doing all he could think of to give her relief. Witness remained in the room until she died. About a quarter of an hour after the witness arrived she said “Cheer up Mrs. De Marco, you’ll soon be better”. She said “No Idie, no better” They had their arms around each other necks when she died. Herbert Percy Critchett Gorrick, a Legally qualified Medical Practitioner and Government Medical Officer at Cassilis, disclosed that at the request of the Police he made enquiries into the cause of the death of Rachel Ines De Marco. After having examined the body and heard the evidence given before the Court, he was of the opinion that the said death was due to poisoning with corrosive sublimate. He saw the bedclothes and all the exhibits in the case, and noted all necessary particulars to allow hi to come to the above conclusion. 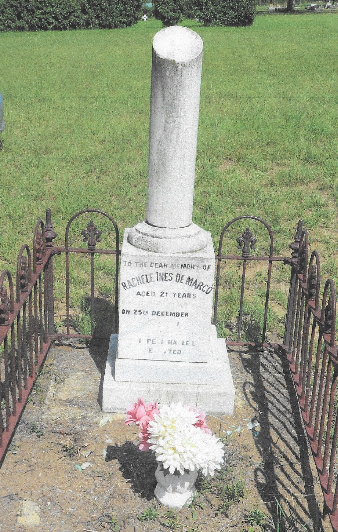 The Jury found that the deceased Rachel Ines De Marco, at Coolah, on 25th December 1899 died from poisoning by corrosive sublimate, but the evidence was insufficient to show by whom such poison was administered. The Jury stated their opinion that there was no suspicion resting on Dr. De Marco but could not agree to alter their verdict. THE FOLLOWING ARE GENERALLY ITEMS EXTRACTED FROM THE BOOK CALLED ‘AROUND THE BLACK STUMP’ written by Roy Cameron who has very kindly passed on this information and allowed me to copy it into this website. Dr. Emilo De Marco who practiced at Coolah from 1899 to 1901, qualified at the University of Bologna in 1898 and was registered in New South Wales on 2nd November in 1898. He came to Coolah as the result of an appeal by a local committee comprising Messrs J McMaster, Binnia Downs, J McMaster, Morven and J.W. Swanston, Booyamurra and O.M. Scholer, T.H. Preston and Rev. F.J. Harris. The Committee guaranteed him a minimum yearly bonus of 80 pounds. Dr. De Marco and his 21 year old wife Rachael took up residence at Loloma at about a mile from Coolah. On Christmas Day they were invited out for Christmas dinner, but Mrs. De. Marco excused herself as she was not feeling well. The doctor went. Mrs. De Marco sent a boy on an errand, he returned to find her suffering violentl. He went for the doctor. Some hours later she died. A Magisterial Enquiry was held by Kenneth Murchison of Coonabarabran. He found that the death had resulted from poison, but could not decide if it was self administered. The Mudgee Guardian stated “The exact story of the death of Mrs. De Marco of Coolah will probably never be written for the truth has died with the unhappy woman”. A correspondent of the News Letter of 28th May 1904, writing mainly about people stating that the Italian Doctor at the Whitecliffs Opal Field having left, has been succeeded by compatriot Dr. De Marco formerly of Coolah, whose very handsome Italian wife died four years ago under very sad circumstances. The writer of this article had met the lady who looked like a very fine type of Italian beauty – as the old masters used to paint. 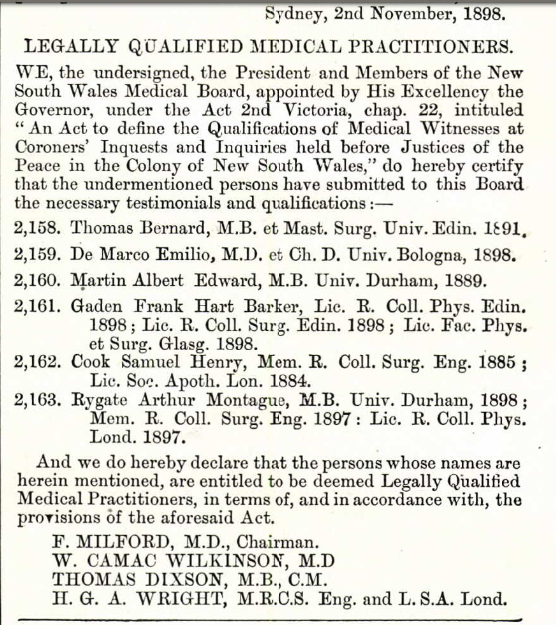 Dr. Emilio De Marco, late of Bingara, New South Wales, passed away in the Royal Prince Alfred Hospital, Camperdown on 13th June 1912 aged 37 years. According to the Orange Leader he had succumbed to a poisoned hand. Born in 1875 he was about 24 years old when his first wife died at Coolah. Emilio was buried in the Church of England Cemetery at Waverley. He was born in Italy and spent ten years in New South Wales. His second marriage was to Ethel Guildford of Coolah and they had one child Lucy C.Y. De Marco. Lucy was living with her mother when in 1929 she announced her engagement to Wallace Schofield, the eldest son of Mrs and Mrs Schiofield of the Royal Hotel at Young. Ether Guilford De Marco died in Potts Point on 27th April 1952. Lucy Ines, her daughter predeceased her on 10th February 1934, aged only 28 years. Mother Emma Elizabeth Guildford was born in Sydney on 8th December 1848 and came to Cassilis when very young. She married Richarad Guilford at Cassilis in 1868 and then moved to live at Turee Creek. Several families from the Hunter took up small blocks, generally 40 acres, at Turee Creek before moving into Coolah. At the time Tuyree Creek had a church, a school, a cemetery and a pony track over the Coolah Tops giving access to the Liverpool Plains. Mrs. Guilford lived at Turee Creek for 16 years and came to Coolah in 1884. In the unconsecrated section of the Coolah Cemetery are buried two persons who are said to have taken their own lives. One is Rachele Ines De Marco, aged 21 years, buried in the year 1899, wife of the local Doctor Emilio De Marco. The other is recorded in the year 1910 as Mahala Bourne, 30 years old, daughter of the local school headmaster James W.F. Bourne. Two headstones in the Coolah Cemetery with broken columns signify that the persons buried have only lived short lives. One is to Rachele Ines De Marco. Rachele has now been buried for 120 years. Rachele’s maiden name was CORRADINI and she married Emilio in New South Wales earlier in 1899.